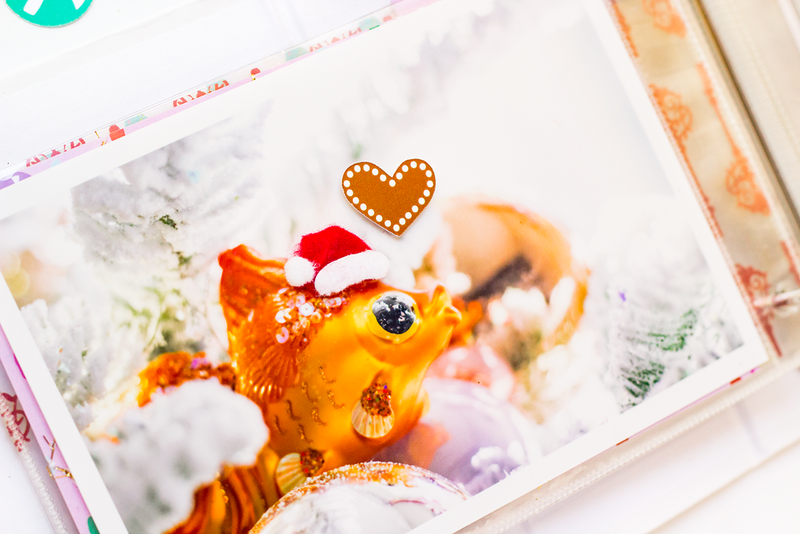 To start off I added the brown heart die cut directly onto my 4x6 photo along with a Santa hat from Little B. I super love how the goldfish ornament is swimming among the other ornaments, and thought he would look cute with a hat and a heart. On the opposite page is a 3x4 photo with “OUR TREE” written in the Thicker font Happy Life, again placed directly onto the photo. Next to it is a 3x4 shaker pocket with the number 2 punched out into a circle from one of the cut apart sheets. I’ts slightly popped up using foam adheasive and layered over another circle that is only slightly larger which was punched from one of the 12x12 papers. They are attached to a 3x4 piece of transparency and I added in a few aqua and gold sequins. To keep with the same shape on the opposite side of the shaker pocket, I added another of the larger circles punched from the same 12x12 paper. This time instead of layering it with the date I punched out the pink and green “joy” from one of the cut apart sheets. Since the circles are mounted on both sides of a 3x4 piece of transparency I decided to add some more of the same sequins into this side to complete the shaker. Next to it is another 3x4 photo of our tree. 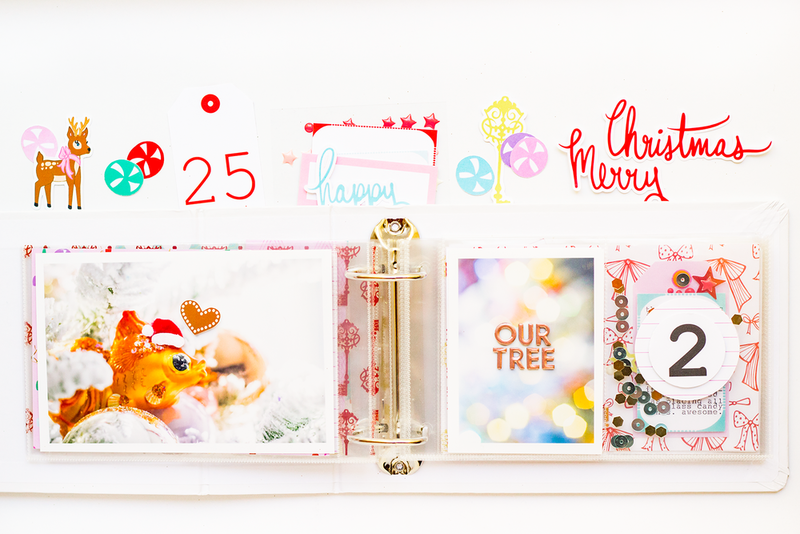 For the final page of this spread I chose the beautiful bow paper and cut a 4x6 card from the 12x12 sheet. I added the “Mama, let’s decorate.” using the same Thickers, but this time used gold instead of rose gold. To add my journaling, I ran the blue label from one of the cut apart sheets through my typewriter and popped it up slightly using some foam paper layered over a pink tag also from the same cut apart sheet. To add just a little extra something I also added an orange eyelet to the tag. As a final bit of embellishment I placed three of the stars from the die cut pack across the 4x6 card and layered enamel stars and dots from Studio Calico Seven Paper for added dimension…..and that’s it.